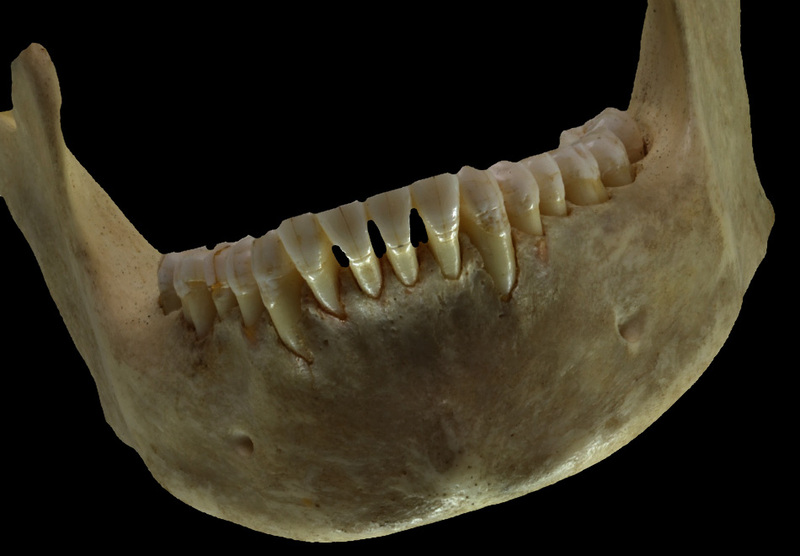 Scott obtained samples of dental calculus from 58 skeletons buried in the Cathedral of Santa Maria in northern Spain dating from the 11th to 19th centuries to conduct research on the diet of this ancient population. After his first methodology met with mixed results, he decided to send five samples of dental calculus to Poulson at the University’s Stable Isotope Lab, in the off chance they might contain enough carbon and nitrogen to allow them to estimate stable isotope ratios. Scott said that once at the lab, the material was crushed, and then an instrument called a mass spectrometer was used to obtain stable carbon and nitrogen isotope ratios. Scott explained that the common practice of using bone to conduct such research is cumbersome and expensive, requiring several acid baths to extract the collagen for analysis. The process also destroys bone, so in many instances, it isn’t permitted by museum curators. Scott said that although additional work is necessary to firmly establish this new method of using dental calculus for paleodietary research, the results of this initial study indicate it holds great potential. The study, “Stable carbon and nitrogen isotopes of human dental calculus: a potentially new non-destructive proxy for paleodietary analysis,” is published in the May 2012 issue of the Journal of Archaeological Science. Photo Cutline: Centuries ago, dental calculus would build up through the years, layer after layer, like a stalagmite, sometimes reaching impressive proportions. University of Nevada, Reno researchers have discovered that analysis of tiny fragments of this material can be used effectively in paleodietary research – the study of diets of earlier ancient and populations – without the need to destroy bone, as other methods do. Photo by G. Richard Scott, University of Nevada, Reno. Nevada’s land-grant university founded in 1874, the University of Nevada, Reno has an enrollment of 18,000 students and is ranked in the top tier of the nation’s best universities. Part of the Nevada System of Higher Education, the University has the system’s largest research program and is home to the state’s medical school. With outreach and education programs in all Nevada counties and with one of the nation’s largest study-abroad consortiums, the University extends across the state and around the world. For more information, visit www.unr.edu.